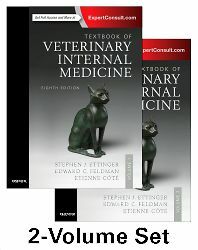 The Textbook of Veterinary Internal Medicine, Expert Consult, 8th Edition remains the internationally acclaimed "gold standard" in veterinary medicine with its unparalleled coverage of pathophysiology, diagnosis, and treatment of diseases affecting dogs and cats. This one-of-a-kind resource includes the latest information on topical issues such as the genome, clinical genomics, euthanasia, innocent heart murmurs, hyperbaric medicine, home prepared and raw diets, obesity, botulism, artificial pacing of the heart, and cancer vaccines; plus it covers exclusive information on toxicology, nutrition, critical care, and pharmacology. Similar to the previous edition, the new 8th edition combines the convenience of a two-volume printed textbook with the enhanced functionality of an Expert Consult website that lets you electronically search your entire book and find information more efficiently. With instant access to the most reliable information available, it's the surefire way to stay at the forefront of veterinary care!